By sounds of the forum name, I am in the right place! 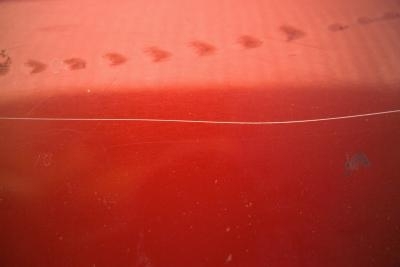 As you guys can see from the title I have a key scratch down the side of my car. On the way to get in my car to go to work this morning I noticed a 6 inch long key scratch down the door panel on my Integra. Pi**ed off is an understatement. There is no way I can afford to re-spray the panel so I was hoping some of you guys might have an awesome remedy/technique that could get this scratch blended in as best as possible. I have heard of some people using these http://www.for-sale.co.uk/touch-paint-pen touch up paint pens, do they do the job? Looking forward to some replies guys it's greatly appreciated! Last edited by Osib; 09-10-2017 at 11:12 PM. don't think there's much else that can be done. Insurance? It's going to be tough to fix it by hand. You could try wet sanding it out and then polishing it. It may not remove the scratch entirely without repainting it, but it will certainly look a ton better. Another option I really like is Dr Colorchip. It's a process where you basically finger paint body shop paint into the scratch and then wipe over it with their special solvent. The solvent leaves the paint in the scratch, but wipes it off the rest of the surface. It is essentially like painting it, sanding it, and then polishing it, but without all that extra work. I've been using it for years on several cars and it has always worked really well. It is a good solution for a scratch like this. Just a thought... Google Dr Colorchip. They have a site where you give them your paint code and they send you the right paint. It's body shop paint, so not the thick tar that you get from a duplicolor jar. This is much thinner and works great. It has always been a great color match too, although with red you can expect that your paint has faded some, so you may be left with a darker red scratch showing regardless of what kind of paint you buy based on your color code. You can get paint from a auto paint shop, mix with clear coat 60/40 ratio. Use a plastic toothpick and dab it in the scratch. Less is more and do it in 3 stages. When the paint has filled the scratch you can brush on a clear coat if you can still feel the scratch. Wet sand very lightly to blend and then buff and wax it. thanks for the great descriptions guys I like the sound of the Dr. Colourchip Method and the 60/40 ratio paint shop paint toothpick method. I am going for a trip to the shops tomorrow so I will start pricing up some paints and materials. Thanks for the help guys I will be back with some pictures of the outcome soon enough. I've had good success with a thin artist brush. This will keep you filling just the scratch and not the getting paint where it's not intended. The secret is to match the paint, but even if it is not exactly a perfect match, it's better than a rust line. Ive never had luck with paint match pens.